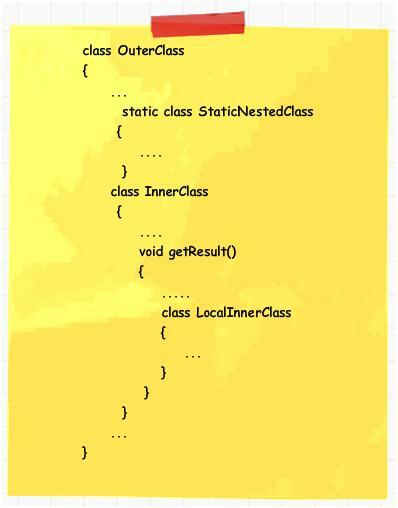 Nested classes are divided into two parts: “static Nested class” and “non – static nested class”. Static Nested class : A nested class defined with keyword static is known as static Nested class. Anonymous Class : A class which does not have any name is known as Anonymous Class. 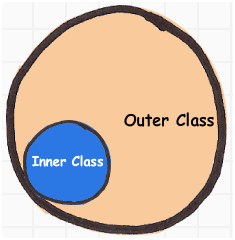 Local Inner Class : A class defined within method is known as Local Inner Class. Example : In JAVA API, Linked List class have declared “Entry” as static nested class. There is no need for LinkedList.Entry to be top-level class as it is only used by LinkedList (there are some other interfaces that also have static nested classes named Entry, such as Map.Entry – same concept). And since it does not need access to LinkedList’s members, it makes sense for it to be static – it’s a much cleaner approach. A class which does not have name is known as “Anonymous class”. These classes are mostly used in AWT event handlers. It is good to use the Anonymouse class, if it is not going to be used any where else. Logical grouping of classes”” If a class is useful to only one other class, then it is logical to embed it in that class and keep the two together. Nesting such “helper classes” makes their package more streamlined. Increased encapsulation””Consider two top-level classes, A and B, where B needs access to members of A that would otherwise be declared private. By hiding class B within class A, A’s members can be declared private and B can access them. In addition, B itself can be hidden from the outside world. More readable, maintainable code””Nesting small classes within top-level classes places the code closer to where it is used. you should have feature of LIKE link on your tutorial for self assesment.